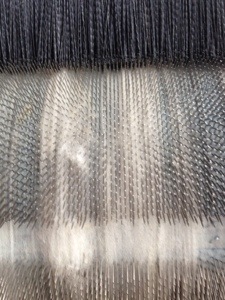 There are, of course, whole books written on spinning and weaving but the following is the gist of the process. 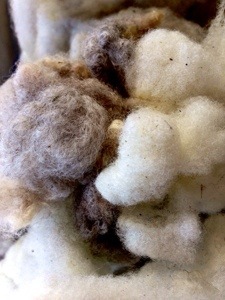 First find a sheep willing to part with its winter coat. 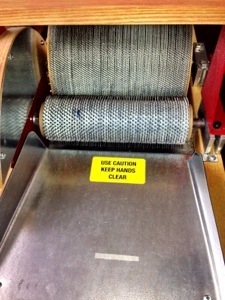 Then shear it. Okay, so I let someone else do that part. 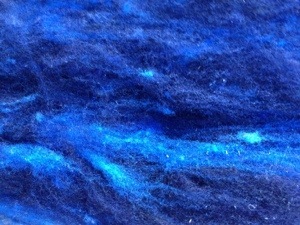 I bought it bagged up at a fiber festival. Here it is next to four gallon dye pot. 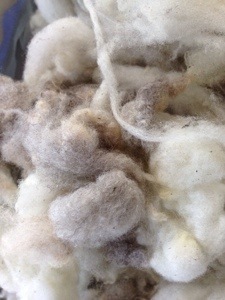 Here’s some of it on its way to being washed. I strongly suspect the sheep in question loved to roll around on its back. 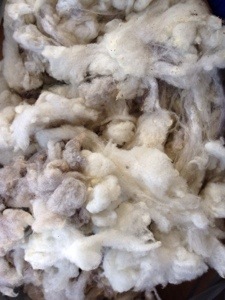 The fleece was quite dirty. 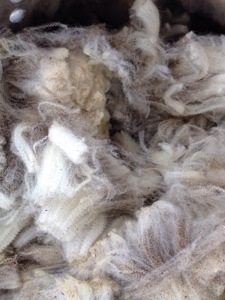 Rambouillet is a soft, fine fiber like merino only very springy. 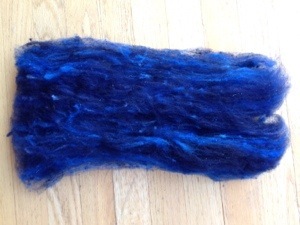 I use my big dye pot and stick the wool in a special mesh bag I bought at a fiber store. As I said, I suspect this sheep of rolling around on its back. A lot. The fiber was very muddy with lots of bits of grass in it. I even found a small dried flower. I soaked it in water. The rinse water looked like liquid mud. I soaked it water again. Then the water looked like diluted liquid mud. 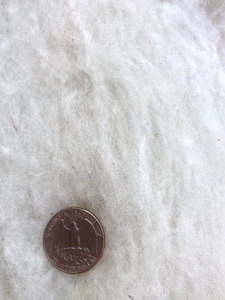 I soaked it a while with ordinary laundry detergent, rinsed again. Then it almost looked like clean water but there was sand in the bottom of the pot. 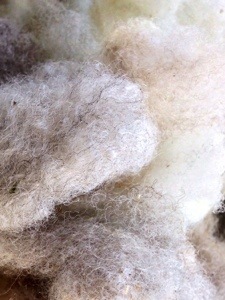 Wool has a lot of lanolin in it. That’s very greasy stuff. 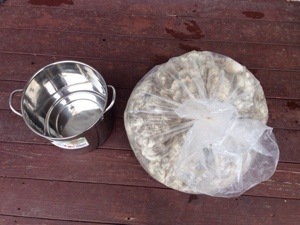 So then I soaked it in an ecologically friendly wool scour product called Kookaburra, then rinsed again. 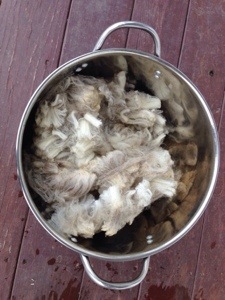 Then I washed with detergent again to get some more lanolin out of it. And rinsed again. The above took all day. Then I put it in the washer on spin cycle to get the excess water out. 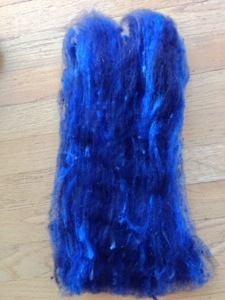 Then it was left to air dry overnight. 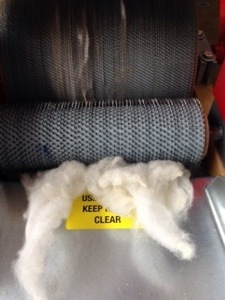 Then I ran the fibers through the drum carder. 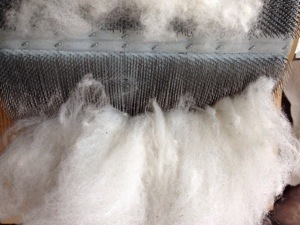 A drum carder consists of two cylinders. 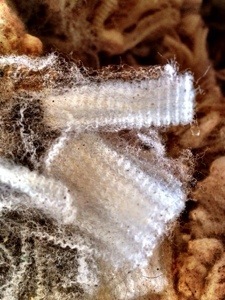 The smaller cylinder is covered with little blades that helps to separate the fibers. 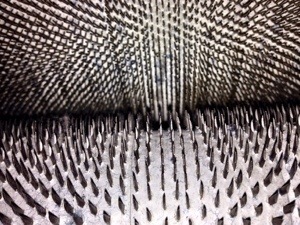 The larger cylinder is covered with tiny wires like a pet brush. 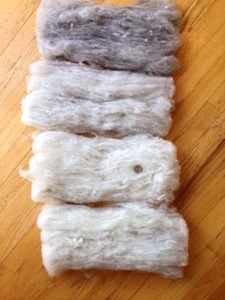 I ran the medium gray wool through together, then the light grey, and then the whiter wool resulting in four batts. 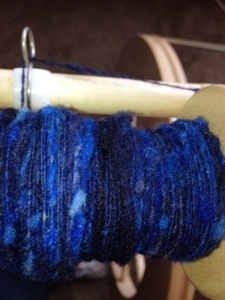 Then I spun the wool. 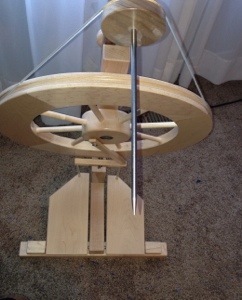 Spinning twists the straightened out fibers around each other. 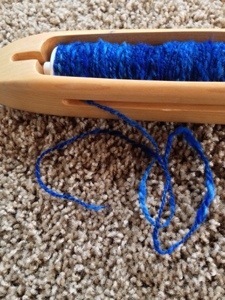 Single ply yarn. 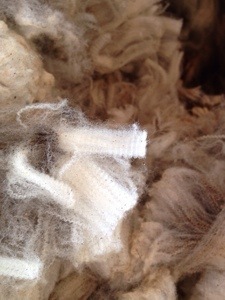 The little lumps are there because the rambouillet came out of the carder with little lumps in it. 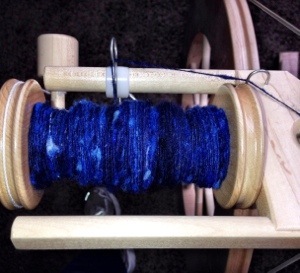 I like them so I spun them into the yarn. 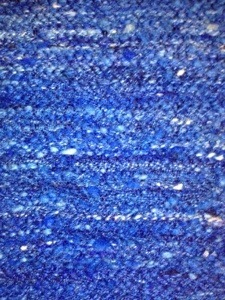 I want the fabric I make to have a lot of texture. 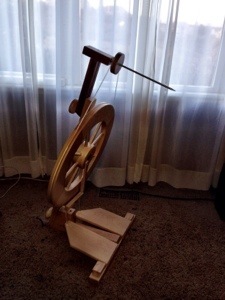 I use my spinning wheel with the quill attachment to wind my yarn onto weaving bobbins. 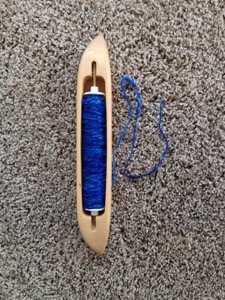 Here’s the yarn on a bobbin inside a weaving shuttle ready to for the loom. 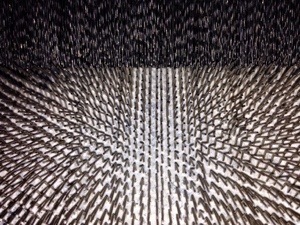 And here it is on the loom woven into a fabric. 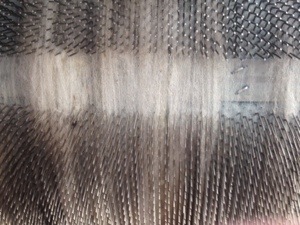 I deliberately chose a weaving pattern that shows off the hand spun yarn instead of the commercial thread I used for the warp.